Dette er en transkripsjon av Benjamin Freedmans tale på Willard Hotel i Washington, D.C i 1961 , og den ble originalt oversatt fra tale til tekst av avisen som arrangerte konferansen, Common Sense. Jeg husker ikke lenger hvor jeg lastet ned denne versjonen til et tekstdokument, men talen finnes på en mengde nettsider og i en mengde utgaver. Dette er såvidt jeg kan forstå hele transkripsjonen av det Freedman sa, inkludert en spørsmål/svar-runde til slutt, men med unntak av oppfordring til finansiering av avisen Common Sense helt mot slutten. Av en eller annen grunn lærte jeg aldri om Benjamin Freedman da jeg gikk på skolen, noe jeg synes er merkelig i en verden der Lamestream akademikere og De presstituerte påstår at de er formidlere av fakta. Det er så en kan mistenke historikere og De presstituerte for å løpe verdens egentlige bokbrenneres ærend. De som har lest en del av det jeg har skrevet her på bloggen og annet steds vil kjenne igjen noen av de personene og hendelsene Freedman nevner. Hans tale er svært viktig med tanke på de dramatiske tingene som skjer i verden akkurat nå. 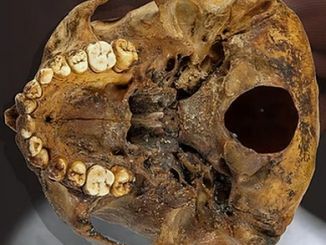 Vi har blitt nektet sannheten om historien, og de som ikke vet noe om historien, kan heller ikke lære av den. Dette gjør oss nærmest forsvarsløse overfor de kriminelle kreftene som kontrollerer menneskehetens dukkestrenger og styrer oss som de vil. I transkripsjonen (eller en senere oversettelse/versjon) har de puttet inn noen – – og et par — som jeg tror er satt inn der noen ord av talen var umulige å forstå, jeg har hørt den mange ganger, og er ikke sikker. Ellers er dette rimelig grei skuring. Talen er en av de viktigste som er holdt, men den vil dessverre aldri bli hengt opp i glass og ramme på Pusebakken der Bolsjevikpartienes og Grilldressunionens partiledere på hver sine måter i tiår har ofret vårt land til fordel for de kreftene Benjamin Freedman advarer mot i talen. Lytt til Freedman. Han arbeidet tett på både sionister og politikere, og det han lærte må ha vært årsaken til at han senere så det som som livsoppgave å advare verden mot den faren sionismen utgjorde den gang. Hadde Benjamin Freedman levd i dag og sett at det eneste som har endret seg siden hans dager er at sionistenes kamp mot menneskeheten har økt i intensitet og styrke, tror jeg han ville blitt svært bedrøvet. Hvem gjennomførte den russiske revolusjonen? Askenasikhazarene. Forsøket på kommunistkupp i Tyskland? De samme. Hvem presset verden ut i to verdenskriger? Dere vet svaret. Les hva han har å fortelle om dette. Hele talen finnes også på Youtube, og de som ønsker høre ham tale i stedet for å lese talen finner den enkelt. Det er imidlertid noe med det skrevne ord, det fester seg kanskje bedre, og ikke minst, det gjør det enkelt å plukke ut sitater av det den enkelte leser mener har særdeles stor betydning og ønsker å spre videre. And what is the reason? The reason is that here in the United States, the Zionists and their co-religionists have complete control of our government. For many reasons too many and too complex to go into here at this time — I’ll be glad to answer questions, however, to support that statement — the Zionists and their co-religionists rule this United States as though they were the absolute monarchs of this country. You must remember, Germany, at the time of Napoleon, at the time of the French Revolution, what was the German Reich consisted of 300 — three hundred! — small city-states, principalities, dukedoms, and so forth. Three hundred little separate political entities. And between that time, between the period of … between Napoleon and Bismarck, they were consolidated into one state. And within 50 years after that time they became one of the world’s great powers. Their navy was rivalling Great Britain’s, they were doing business all over the world, they could undersell anybody and make better products. And what happened? What happened as a result of that? So they did take appropriate action against them [against the Jews]. They … shall I say, discriminated against them wherever they could? They shunned them. The same as we would the Chinese, or the Negroes, or the Catholics, or anyone in this country who had sold us out to an enemy and brought about our defeat. Now, after a while, the Jews of the world didn’t know what to do, so they called a meeting in Amsterdam. Jews from every country in the world attended in July 1933. And they said to Germany: “You fire Hitler! 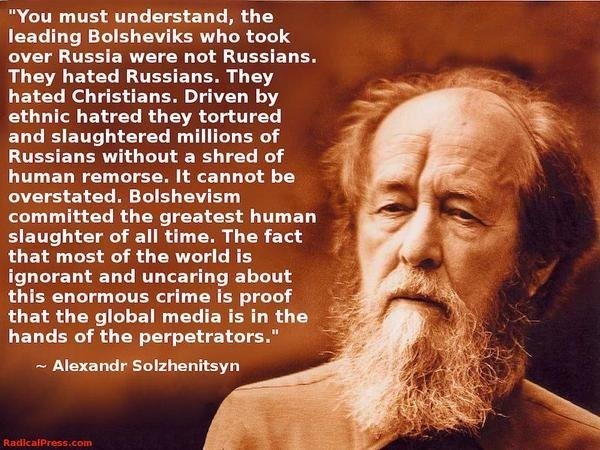 And you put every Jew back into his former position, whether he was a Communist, no matter what he was. You can’t treat us that way! 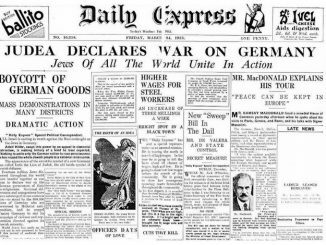 And we, the Jews of the world, are calling upon you, and serving this ultimatum upon you.” Well, the Germans told them … you can imagine. So what did they [the Jews] do? Well, I don’t want to go by what they were called. We’re now using English words, and what they were called in Germany is not very material … but they were Communists, because in 1917, the Communists took over Germany for a few days. Rosa Luxembourg and Karl Liebknecht, and a group of Jews in Germany took over the government for three days. In fact, when the Kaiser ended the war, he fled to Holland because he thought the Communists were going to take over Germany as they did Russia, and that he was going to meet the same fate that the Czar did in Russia. So he left and went to Holland for safety and for security. Well, that’s the way they were fighting the Jews in Germany. And, at that time, mind you, there were 80 to 90 million Germans and there were only 460,000 Jews … less than one half of one percent of Germany were Jews. And yet, they controlled all of the press, they controlled most of the economy, because they had come in and with cheap money — you know the way the Mark was devalued — they bought up practically everything. R. H. Macy, which is controlled by a family called Strauss who also happen to be Jews … a woman found stockings there which came from Chemnitz, marked “made in Germany”. Well, they were cotton stockings. They may have been there 20 years, because since I’ve been observing women’s legs in the last twenty years, I haven’t seen a pair with cotton stockings on them. So Macy! I saw Macy boycotted, with hundreds of people walking around with signs saying “MURDERS” and “HITLERITES”, and so forth. Now, that … naturally, the Germans said, “Why, who are these people to declare a boycott against us and throw all our people out of work, and our industries come to a standstill? Who are they to do that to us?” They naturally resented it. Certainly they painted swastikas on stores owned by Jews. So, what do we face now? If we trigger a world war that may develop into a nuclear war, humanity is finished. And why will it take place? It will take place because Act III … the curtain goes up on Act III. Act I was World War I. Act II was World War II. Act III is going to be World War III. Well, they were pagan Khazars who were converted just the same as the Irish [were converted]. And it’s just as ridiculous to call them “people of the Holy Land,” as it would be … there are 54 million Chinese Moslems. Fifty four million! And, Mohammed only died in 620 A.D., so in that time, 54 million Chinese have accepted Islam as their religious belief. Now imagine, in China, 2,000 miles away from Arabia, where the city of Mecca is located, where Mohammed was born … imagine if the 54 million Chinese called themselves ‘Arabs’. Imagine! Why, you’d say they’re lunatics. Anyone who believes that those 54 million Chinese are Arabs must be crazy. All they did was adopt as a religious faith; a belief that had its origin in Mecca, in Arabia. Now, these Pagans, these Asiatics, these Turko-Finns … they were a Mongoloid race who were forced out of Asia into eastern Europe. They likewise, because their king took the faith — Talmudic faith — they had no choice. Just the same as in Spain: If the king was Catholic, everybody had to be a Catholic. If not, you had to get out of Spain. So everybody — they lived on the land just like the trees and the bushes; a human being belonged to the land under their feudal system — so they [Khazars] all became what we call today, Jews! And because they control the newspapers, the magazines, the radio, the television, the book publishing business, they have the ministers in the pulpit, they have the politicians on the soap boxes talking the same language … so naturally you’d believe black is white if you heard it often enough. You wouldn’t call black black anymore — you’d start to call black white. And nobody could blame you. Now, that is one of the great lies … that is the foundation of all the misery that has befallen the world. Because after two wars fought in Europe — World War I and World War II — if it wasn’t possible for them to live in peace and harmony with the people in Europe, like their brethren are living in the United States, what were the two wars fought for? Did they have to — like you flush the toilet — because they couldn’t get along, did they have to say, “Well, we’re going back to our homeland and you Christians can help us”? I can’t understand yet how the Christians in Europe could have been that dumb because every theologian, every history teacher, knew the things that I’m telling you. But, they naturally bribed them, shut them up with money, stuffed their mouths with money, and now … I don’t care whether you know all this or not. It doesn’t make any difference to me whether you know all these facts or not, but it does make a difference to me. I’ve got, in my family, boys that will have to be in the next war, and I don’t want them to go and fight and die… like they died in Korea. Like they died in Japan. Like they’ve died all over the world. For what? To help crooks hold on to what they stole from innocent people who had been in peaceful possession of that land, those farms, those homes for hundreds and maybe thousands of years? Is that why the United States must go to war? Because the Democratic Party wants New York State — the electoral vote? Illinois, the electoral vote? And Pennsylvania, the electoral vote?… which are controlled by the Zionists and their co-religionists? … the balance of power? But … I want to tell you one more thing. You talk about… “Oh, the Jews. Why the Jews? Christianity. Why, we got Christianity from the Jews and the Jews gave us Jesus, and the Jews gave us our religion”. But do you know that on the day of atonement that you think is so sacred to them, that on that day… and I was one of them! This is not hearsay. I’m not here to be a rabble-rouser. I’m here to give you facts. Now I want to say one thing. You ask me … well, you think to yourself: “well how did this fellow get mixed up in this the way he got mixed up in it.” Well, I opened my mouth in 1945, and I took big pages in newspapers and tried to tell the American people what I’m telling you. And one newspaper after another refused the advertisement. And when I couldn’t find a newspaper to take them — I paid cash, not credit — what happened? My lawyer told me, “There’s an editor over in Jersey with a paper who will take your announcement”. So, I was brought together with Mr. McGinley, and that’s how I met him. Now, I say this, and I say it without any qualifications. I say it without any reservations. And I say it without any hesitation … if it wasn’t for the work that Mr. Conley McGinley did with “Common Sense” — he’s been sending out from 1,800,000 to 2,000,000 every year — if it wasn’t for the work he’s been doing sending those out for fifteen years now, we would already be a communist country. Nobody has done what he did to light fires. Many of the other active persons in this fight learned all about if for the first time through “Common Sense”. How he’s managed to survive, I don’t know. God alone knows. And he must be in God’s care because how he’s pulled through his sickness and with his financial troubles, I don’t know. But that press is working … and every two weeks about a hundred or a hundred-fifty-thousand of “Common Sense” go out with a new message. And if that information could be multiplied … if people that now get it could buy ten or twenty five, or fifty, give them around. Plow that field. Sow those seeds, you don’t know which will take root, but for God’s sake, this is our last chance. Then, between 1345 and the 17th century, when the press came into use, that word passed through so many changes… I have them all here. If you want I can read them to you. I will. That word ‘gyu’ which was in the Wycliffe Bible became … first it was ‘gyu’, then ‘giu’, then ‘iu’ (because the ‘i’ in Latin is pronounced like the ‘j’. Julius Caesar is ‘Iul’ because there is no ‘j’ in Latin) then ‘iuw’, then ‘ieuu’, then ‘ieuy’, then ‘iwe’, then ‘iow’, then ‘iewe’, all in Bibles as time went on. Then ‘ieue’, then ‘iue’, then ‘ive’, and then ‘ivw’, and finally in the 18th century… ‘jew’. Jew. Look at what happened to Germany for touching Jews. What would you, as a citizen of the United States, do to people who did to you what the so-called Jews — the Pollacks and Litvaks and Litzianers — they weren’t Jews, as I just explained to you. 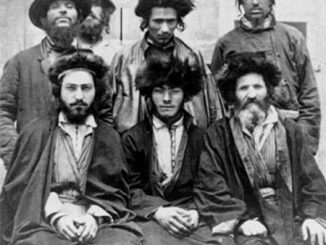 They were Eastern Europeans who’d been converted to Talmudism. There was no such thing as Judaism. Judaism was a name given in recent years to this religion known in Bible history as Torah [inaudible]. No Jew or no educated person ever heard of Judaism. It didn’t exist. They pulled it out of the air … a meaningless word. Yes, ma’am. Well… I can answer that. First of all, your first premise is wrong. Your first premise that all the Jews are loyal to each other is wrong. 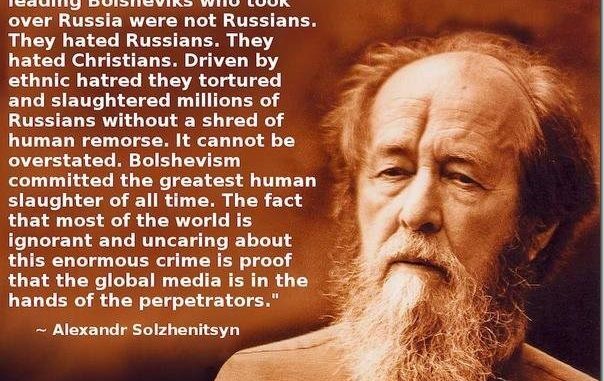 Because, the Eastern European Jews outnumber all the rest by so many that they create the impression that they are the Jewish ‘race’; that they are the Jewish nation; that they are the Jewish people … and the Christians swallow it like a cream puff. Now, I’ll also show you from an official document by the man responsible for … uh, who baptized this race. 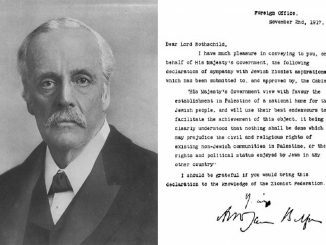 Here is a paper that we obtained from the archives of the Zionist organization in New York City, and in it is the manuscript by Sir James A. Malcolm, who — on behalf of the British Cabinet — negotiated the deal with these Zionists. And in here he says that all the jews in England were against it. The Jews who had been there for years, the [inaudible — probably Sephardim], those who had Portuguese and Spanish ad Dutch ancestry… who were monotheists and believed in that religious belief. That was while the Eastern European Jews were still running around in the heart of Asia and then came into Europe. But they had no more to do with them than … can we talk about a Christian ‘race’? or a Christian religion?… or are the Christians united? [Question inaudible] Freedman: You know why? Because if they don’t, they’re decked up. They come around and they tell you how much you must give, and if you don’t … oh, you’re anti-Semitic. Then none of their friends will have anything to do with them, and they start a smear campaign … and you have got to give. Do you know why the Jews were driven out of England? King Edward the First in 1285 drove them out, and they never came back until the Cromwell Revolution which was financed by the Rothschilds. For four-hundred years there wasn’t a Jew. But do you know why they were driven out? Because in the Christian faith and the Moslem faith it’s a sin to charge ‘rent’ for the use of money. In other words — what we call interest [usury] is a sin. So the Jews had a monopoly in England and they charged so much interest, and when the Lords and Dukes couldn’t pay, they [Jews] foreclosed. And they were creating so much trouble that the king of England finally made himself their partner, because when they they came to foreclose, some of these dukes bumped off the Jews … the money-lenders. So the king finally said — and this is all in history, look up Tianson [Tennyson?] or Rourke, the History of the Jews in England; two books you can find in your library. When the king found out what the trouble was all about, and how much money they were making, he declared himself a fifty-percent partner of the money lenders. Edward the First. And for many years, one-third of the revenues of the British Treasury came from the fifty-percent interest in money-lending by the Jews. What right did they have to take over Russia the way they did? The Czar had abdicated nine or ten months before that. There was no need for them … they were going to have a constitutional monarchy. But they didn’t want that. When the constitutional monarchy was to assemble in November, they mowed them all down and established the Soviet Union. Would we say it’s aggression for these Texans to try to get their homes back from the Mexican thieves? Suppose the Negroes in Alabama were secretly armed by the Soviets and overnight they rose up and drove all the whites into the swamps of Mississippi and Georgia and Florida … drove them out completely, and declared themselves the Republic of Ham, or the Republic of something-or-other. Would we call it aggression if these people, the whites of Alabama, tried to go back to their homes? Would we … what would we think if the soviet Union said, “No, those Negroes now occupy them! Leave them there!”, or “No, those Mexicans are in Texas. They declared themselves a sovereign state. Leave them there. You have plenty of room in Utah and Nevada. Settle somewhere else”.